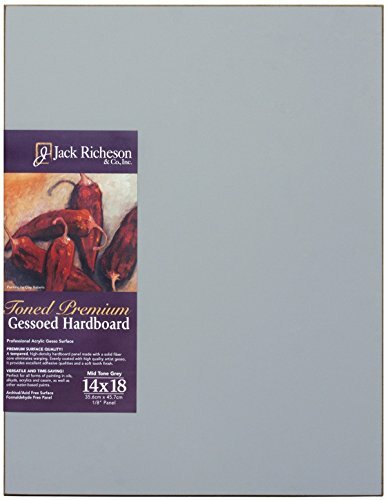 Jack Richeson 1611418 Richeson Mid-Tone Grey Toned Gessoed 1/8 Hardboard 14"X18"
These Boards were developed upon request from numerous professionals in the art materials industry. Because most instructors start by advising students to tone their Boards with either Umber wash or mid-tone grey, these toned Boards are the answer to that need. The double-coat waterfall system yields a controlled, even application of acrylic gesso resulting in the perfectly toothy surface. Tempered high density fiberboard base offeres optimal strength and durability. Jack Richeson 1611224 Richeson Mid-Tone Grey Toned Gessoed 1/8" Hardboard 12"x24"
Jack Richeson 1711824 Richeson Umber Wash Toned Gessoed 1/8" Hardboard 18"x24"
Jack Richeson 1611620 Richeson Mid-Tone Grey Toned Gessoed 1/8 Hardboard 16"x20"
Jack Richeson 1711114 Richeson Umber Wash Gessoed 1/8" Hardboard 11"x14"
Jack Richeson 1611216 Richeson Mid-Tone Grey Toned Gessoed 1/8" Hardboard 12"x16"
Jack Richeson 1711418 Richeson Umber Wash Toned Gessoed 1/8" Hardboard 14"X18"
Jack Richeson 1711224 Richeson Umber Wash Toned Gessoed 1/8 Hardboard 12"x24"
Jack Richeson 1711836 Richeson Umber Wash Toned Gessoed 1/8" Hardboard 18"x36"
Jack Richeson 1711216 Richeson Umber Wash Toned Gessoed 1/8" Hardboard 12"x16"